Learning a language can be a personally enriching experience, with benefits for the brain according to scientists, allowing you to connect with others from different cultures, and a sense of great accomplishment. For educators especially, language acquisition allows for better understanding and communication with students and their respective communities. 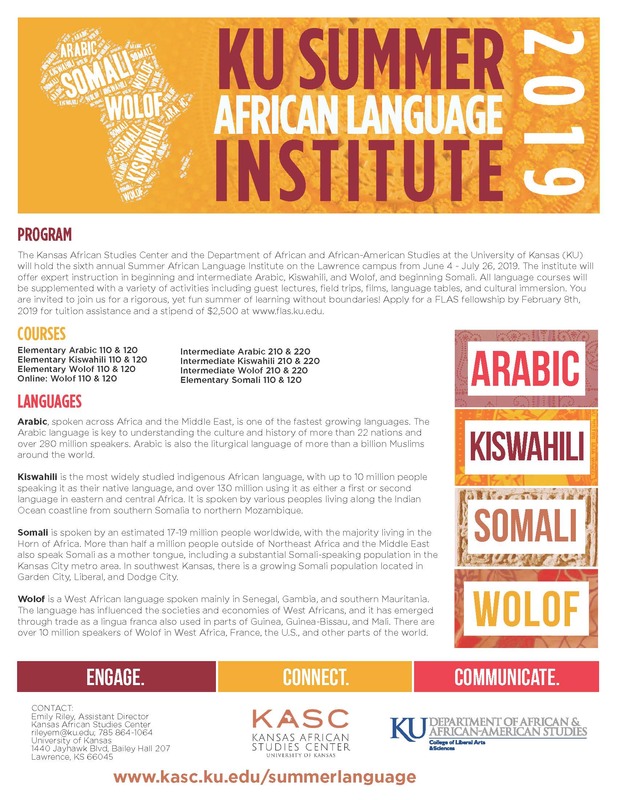 The Kansas African Studies Center has tuition stipends for interested educators to attend the sixth annual Summer African Language Institute (SALI) held on our Lawrence campus. Educators from K-12 schools, minority-serving institutions, and community college instructors are particularly encouraged to apply. The Institute runs from June 4 – July 26, 2019 with intensive language courses Monday through Thursday for four hours per day. Small class sizes give students maximum individual attention from native speakers trained in language education in a fun and relaxed environment. Courses are taught through the Department of African and African-American Studies. Severak stipends of $6,000 each for teachers will be awarded. KU's tuition costs will vary depending on residency and proficiency levels. Classes at the beginner level are 10 credits split between two summer sessions, while classes at the intermediate level are 6 credits split between two summer sessions. What outcomes do you expect from the Institute and how will language acquisition of an African language help you in your role as an educator? How do you intend to incorporate the language into your curriculum or other professional duties? Send questions, and your statement (in a Word document) to KASC Assistant Director, Emily Riley, rileyem@ku.edu. Please contact her with any questions as well.